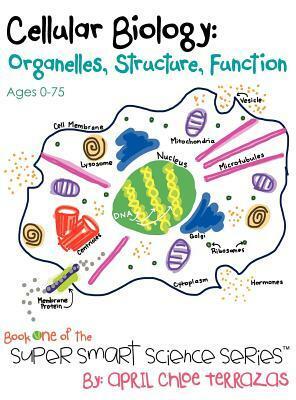 A wonderful book to introduce the basics of cell structure! The pictures are colorful and distinct. I read it with my 6 year old daughter. She was able to read some of it herself, but got discouraged by the large words, so I took over. By the end of the book, she could identify some of the organelles and knew what almost all of them did, even if she didn't remember their names. Pretty sure her favorites were the Golgi! I recommend this book for anyone wanting to get their young children interested in cell biology or for just a basic review! Can't wait to see more in the series! This book was adorable - and it really is beneficial for all ages. Whether you actually are 0 years of age, the pictures are colorful and appealing to the eye, to younger children, teens, young adults, adults, and the elderly, there is use for all to acquire knowledge about basic concepts and terminology in cellular biology. I am actually an undergraduate student with a major in foreign language, but I have always had a little bit of love for science (specifically biology). The author provides accurate models, brief descriptions, and useful hints to help children in particular become familiar with the idea of cellular biology. Overall, a great book - looking forward to the rest of the collection! I received a copy of this book through First Reads.While I am certainly above the grade level that this book is probably intended for, I can see that this book would be very helpful for younger children attempting to learn the basics of cellular biology. The illustrations are very colorful and basic, yet instructive. The pronunciation guides for various difficult-to-pronounce cell parts are a nice addition. Even adults looking to learn the basics of cellular biology will find this to be a useful beginner's guide.Overall, I especially recommend this book for any young child with basic reading skills, but also for adults who would like a basic primer regarding this interesting topic. Cellular Biology is colorful, full of easy to understand text with illustrations on every page to engage the young reader in this part of science. I have used it a couple of times with children and they find the material and subject fascinating. My thanks to April Chloe Terrazas for my copy of Cellular Biology. This is an amazing book for children (AND ADULTS!). Clever sound-it-out sections help a young reader pronounce cell words correctly and beautiful illustrations really keep their attention. I am impressed and I can't wait for the next book in the series! This book is incredible! The pictures and wording is fantastic and easy to understand. Perfect for kids. This is a wonderful book to introduce the basics of cell structure. The illustrations are very colorful.This book would be very helpful for younger children attempting to learn the basics of cellular biology. I won this book through a facebook giveaway. At first, I hadn't thought about reading science books to my 5 year old but when he got his hands on this one, he was hooked. We were shocked! He hadn't shown any real interest in science yet! I asked him his favorite part of this book and he said it was "saying big words." Each new organelle he learned about and learned how to say through the sound it out box, we responded with great excitement at his ability to say these "big words." We personally love that HE loves it so much. He tells his cousins that "the nucleus has dna inside, and dna is what makes each person different." He is so proud of himself. The structure of the book is simple and easy to follow. The organelles are introduced page by page. A review page checks comprehension in the middle, then continues with the other organelles. The book itself is very good, but the effects are the really amazing part. His confidence has sky-rocketed and he is more impatient for the next release than I am for my favorite thrillers! The book is very simple in its descriptions and in its pictures: which is definitely a virtue! I found it interesting that phonetically the book breaks down "organelles" with an "LZ" at the end, while I usually say "elz", so that was something different I learned. The pictures are perfect for 5/6 graders, which is perfectly coinciding with their curriculum, as they require some decoding because of the many lines and colors. Otherwise, this is certainly a book i will have available in my future classroom. I didn't think the bright pictures compensated for the lack of information. The book is a collection of vocabulary words and there are so many new words that they crowd out the "story line." 80% new words in colors that match the pictures doesn't increase the overall comprehension for youngsters. I wouldn't vote for less new words just more normal words in between all the new ones.